Dallas Sometimes if you can’t be good at least hope you’re lucky. Once we were on the ground in Paraguay, we were hustling to fill up the dance card of our agenda with meetings. We had heard the name of a group that was called Techo that was involved in housing. Ok, sounds good, and finally we were able to schedule them as our very last meeting before flying out of the country, but on our third day in the country, my excitement about the meeting changed dramatically. 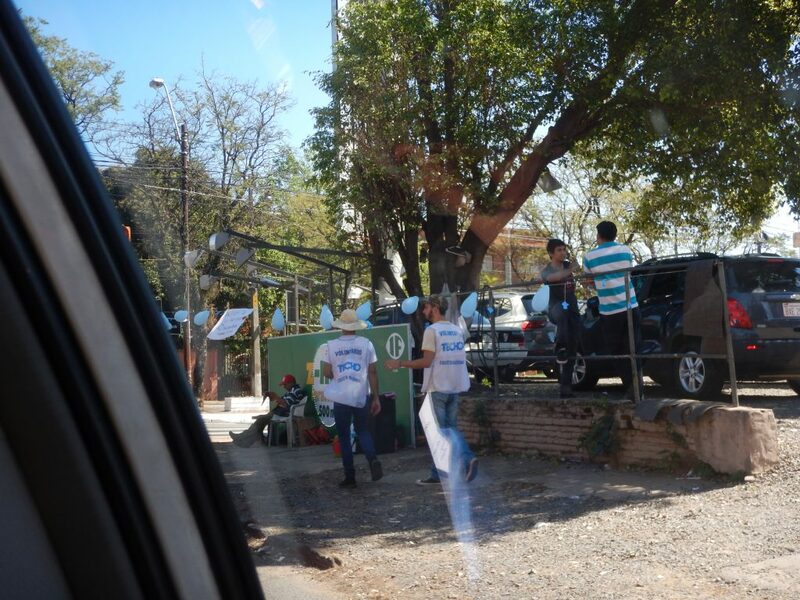 We were in a cab going from the Fundacion Bertoni to our next meeting, and suddenly we had seen some young people “tagging!” Darned, if they didn’t have on white-and-blue t-shirts that said “Techo” on them. A young woman even put her head in the window with a clipboard, and we told her we were going to meet with Techo in a couple of days. Andrew Marciniak, ACORN Toronto head organizer, and one of our intrepid team that made it through the Brazilian visa process to see the amazing Igazu Falls, reported to me that he had seen a bunch of Techo folks doing the same thing at the border. I was excited now: these were my kind of people! If you are an organizer and you have never been part of a tagging operation, I’m not sure you’ve really lived. Tagging is the epitome of street fundraising. ACORN’s tagging operation, originally pioneered in Columbus, Ohio by Fred Brooks, and then picked up in a number of offices, most spectacularly in New Orleans by ACORN and Local 100 United Labor Unions, involved getting old tennis ball cans, putting an ACORN slogan on the outside, taping the can with a slot for money, and putting largely teens and sometimes staff and members on the busiest streets in the cities with the longest stoplights to go car to car to raise money for the organization. Devised initially by firefighters hitting the streets asking for donations into their boots and then giving people a “tag” saying thanks, it was repurposed as a grassroots fundraiser. Don’t scoff either. New Orleans would regularly net more than $1000 on a Saturday in the 1980s. When Cecile Richards, most recently head of Planned Parenthood of America, spoke at an ACORN Year End / Year Beginning Meeting she rightly bragged to the crowd about how great a tagger she was! Meeting Bruno Lopez, the General Manager of Techo Paraguay, and his management team at their amazing headquarters in a donated, rambling house and property in the city, he told us that we had witnessed their annual fundraiser, and though they were still counting, they expected to raise $400,000 USD from their tagging operation, accounting for almost half of their budget. 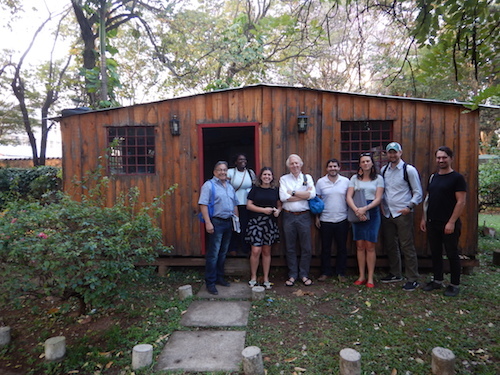 Techo turned out to work in more than twenty Latin American countries and to have its roots in organizing largely young volunteers to build small scale emergency housing for lower income and displaced people after disasters. The housing can last up to 10 years! This is still a huge part of their program, but they have been reaching out and expanding their focus. Sofia, their operations manager, described their emerging organizing “model,” which had many close parallels to the ACORN Organizing Model substituting volunteers for members, adding dues, and other items. Bruno and his team were reflective. They were thinking about making changes and pushing the envelope past the history of their organization and its operations, and were most curious about lessons we might have learned in doing so as well. Luckily, we all felt as we walked away from our last meeting in Asuncion that we had some how saved the best for last! Asuncion Our last day in Asuncion was typical of those for past Organizing Forum delegations. We were only in-country for a week, and now, as our clock wound down and the airlines were calling. we had discovered other groups, neighborhoods and projects that we would have loved to visit and meet, but only learned about through our early meetings. These trips are humbling. New countries have to be approached with an open mind to understand the different challenges other groups face. We come to a country usually without any of us ever having visited, and we leave knowing that we still know little but starting to understand what we could only have imagined before coming. There are also “ah-ha” moments when we may have missed critical understandings, having not asked the right question or enough of them. We walk the balance beam, wanting to get to the nuts and bolts of their work, but also grateful for their time and sensitive to their challenges. For example, in our excellent conversation with the Banco Alimentos, it never occurred to us that all of their distribution was through charities affiliated with the Catholic Church. Learning about Habitat for Humanity Paraguay’s contract to assist in the resettlement of one-thousand families in Barrio San Francisco, talking later to Oxfam Paraguay and others, though they were supportive of Habitat in general, clearly the resettlement and the lack of voice by residents was a critical and contentious issue. 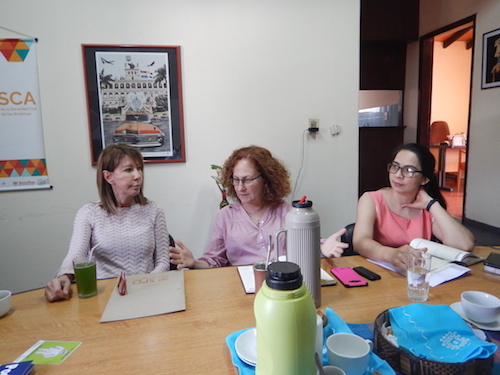 We met with two very interesting NGOs based in Paraguay who had long histories and were undoubtedly pillars of what outsiders and some insiders would define as civil society. Both of them were wholly funded by international bodies whether USAID or the European Union or French, German, and Spanish governmentally-funded bodies. We can’t rush to judgement. As organizers we know information and self-interest is powerful, and every issue is complicated. Semillas para la Democracia or Seeds for Democracy had two primary purposes. One was assisting in the refugee resettlement process by helping refugees access applications and services. 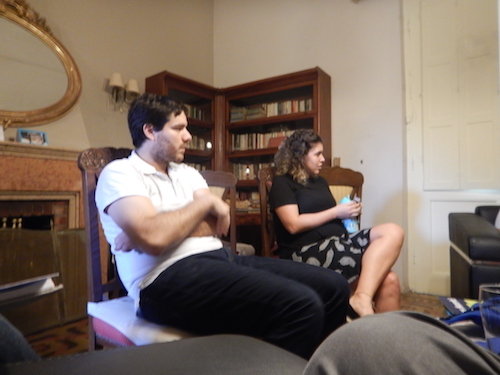 The other was broadly civic engagement, sort of a League of Women Voters of Paraguay, including a strong gender focus. They were interested in making the judiciary more accountable and generally had played a strong role with others in getting an open records law passed. A key interest in their lobbying was trying to establish “open primaries” that would take parties out of their dominant role in elections. When a point was raised about whether that advanced democracy or not, the director conceded it was controversial, and there were pros and cons. 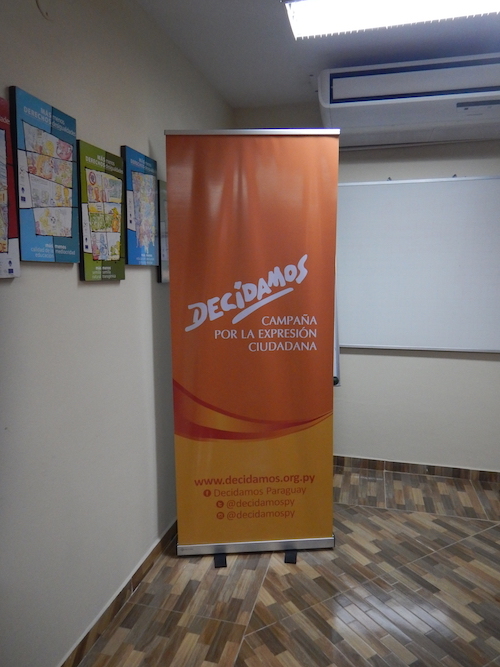 Decidamos or We Decide had a dozen staff on similar research and advocacy projects. 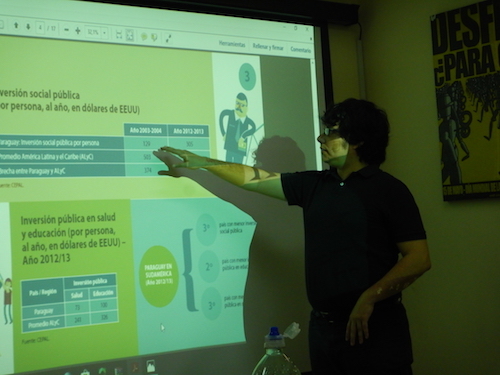 They gave us a detailed briefing of the state of income and poverty in the country and how it ranked compared to other Latin American countries in terms of indirect taxes, informal workers, percentage of the population on social security, and other critical indices of the health and well-being of the population. Paraguay was a leader for all the wrong reasons. Land was terribly concentrated, particularly exacerbated by the dictatorship when more than 5 million hectares were transferred secretly between Strasser, the dictator, and the generals he depended on for his continued power. Another million hectares were transferred in a similar way without transparency or fair value even after 1989 and the end of the dictatorship. When asked, it was clear that Decidamos might tell stories of disputes around the country with campesinos demanding land reform, but this was not an issue that was a focus of their own lobbying or litigation or anyone else’s among the large NGOs. Their big campaign was pushing for more taxes since the top rate for income and corporate tax was only 10% for each, the lowest in South America and one of the lowest in the world. 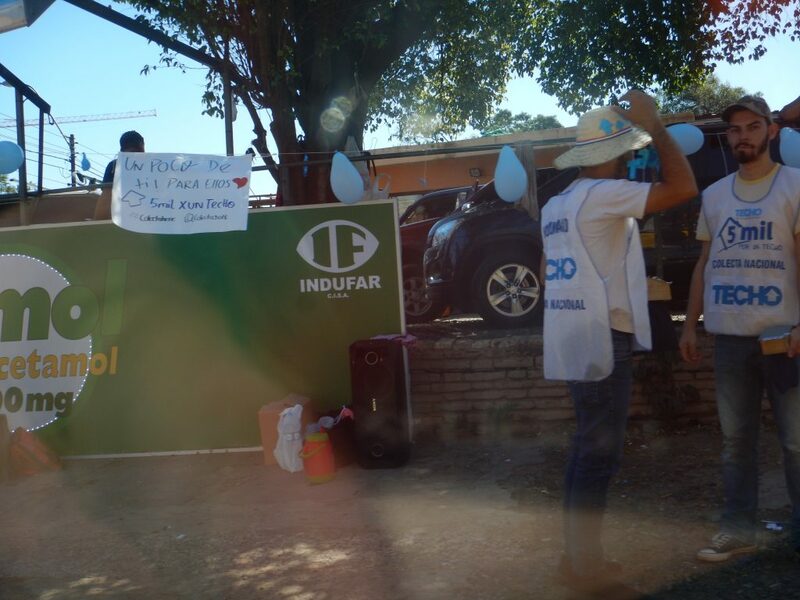 It was hard to tell if these were popular issues with Paraguayans or key items that found traction with the local elites and big international donors, who were the only source of their funds and arbiters of accountability. In most cases their projects were overtly political, even as they declared themselves apolitical and nonpartisan. We were not the only ones walking a tricky balancing beam in their country.